… for forgetting that my new iPhone will do video until the moment was past. I pulled into our alley tonight at 9:38 CDT, to the sight of a family of raccoons running directly towards my car, until they had an attack of good sense and turned and ran the other direction. By other direction, I mean straight back down the alley so that I could follow slowly and keep them in my headlights for a good 90 seconds. By family, I mean 1 adult (I assume mom) and 5, count them, 5, juveniles. Mind you, I was in the Miata with the top down. They probably could have taken me, had they not been awed by the glory of my HID headlights. Categories: iPhone and Silly Stuff. I’m somewhat better at it now. This is wicked cool. 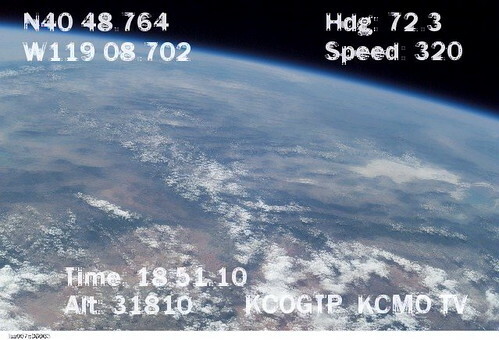 A 17 foot homebrew rocket phones home with this picture. Click through to read the details in the flickr comments. Edit: Lots of cool amateur rocketry pics in the same photoset. Categories: OS X and Toys. Something that had been bothering me for a while is that I have a full 5.1 setup hooked up to my MacBook Pro (via a USB SoundBlaster Live sound card), but generally end up using only two of the speakers. While native 5.1 content (DVDs, HD trailers) does play out all six speakers, any stereo source (like music in iTunes) uses only the two front speakers. Most annoyingly, the subwoofer just sits there doing nothing. I finally figured out how to make stereo sound sources take advantage of the entire setup, with the help of various tools. Luckily, these are all free. Another very useful tool (although not strictly necessary for what we’re doing here) is Soundsource. Soundsource sits in your menu bar, and allows you to select which output device is currently active. You’ll be changing this around quite a bit as you get this whole setup working, so I’d suggest you install it. Finally, if you haven’t installed the OS X development tools, do so now. They’re on the disks that shipped with your machine. Got all that installed? Good. Now the fun begins. On the “SoundSource” menu, select “Open Audio MIDI Setup”. (If you haven’t installed SoundSource, you can find this in “Applications”, under “Utilities”). On the “Audio” menu, select “Open Aggregate Device Editor”. Add an aggregate device, and name it something useful (I called mine “Soundflower Stereo + SB Live”). Select the new aggregate device, and check “Soundflower (2ch)” and whatever your 5.1 soundcard output is (look for a “6” in the out column). You’ll want to make sure the soundflower appears first in the list. You probably want to select the soundcard as the clock source. You can now close the Audio MIDI Setup application. The newly created aggregate device should show up in your AudioSelector menu; and it will probably be selected. We haven’t routed the sound anywhere yet, so any sounds your machine wants to make now won’t come out anywhere. Now, open up the “AU Lab” program — you’ll find it under /Developer/Applications/Audio. You should be in the “Create New Document” window. Make sure the “Audio Device” is set to the aggregate device you created — there should be 8 channels indicated. If you don’t see 8 channels, try changing from the aggregate device to a real device and back again. Now, click “Add Output” three times — you should have four outputs total. Select output 3 and change it to mono. Drag it to channel 5 (this is your center channel). Select output 4, set it to mono, and drag it to channel 6 (this is your subwoofer). Now, grab output 2 and drag it to channels 7 and 8 (this is your rear channel); and, finally, drag output 1 to channels 3 and 4 (front channel). Don’t worry — we’re almost there. Now, under “Inputs,” there should be one input. Sometimes it creates it automatically for you; sometimes you need to add it. Click on “OK”, and you should get a window with a bunch of sliders on it. The lower-left slider should have four little boxes along its left side, labeled “1” through “4”, indicating which outputs this input is routed to. Click on “2”, “3”, and “4” to light them all up. As long as your output is still set to the aggregate device, you should now have music coming all all 6 speakers. Save this document before you close the AU Lab program. One thing to note: the AU Lab program needs to be actively running to route sound from the Soundflower inputs to the outputs on your 5.1 soundcard. If you close AU Lab, your sound is once again routing to nowhere — but this is easily remedied by selecting a real device in the SoundSource menu. You can play around with various effects on the channels to differentiate them. For example, I put a low-pass filter on my subwoofer; added a “Matrix” effect to the center channel to “enhance” the stereo; and put a 0.016 second delay on the rear channel. One last troubleshooting trick that might help if you can’t get the audio flowing: soundflower and your soundcard need to be set to the same sample frequency or things just won’t work. I also had trouble converting 24-bit samples to 32-bit samples, but 16-bit to 32-bit seemed to work just fine. You can tweak these settings in the “Audio MIDI Setup” application. As an aside — you don’t want this configuration active when watching actual 5.1 sources, as it will not only route the front channels to all six speakers; it will also send the center channel to the left front speaker; the subwoofer channel to the right front speaker; the rear left channel to the center speaker; and the rear right channel to the subwoofer speaker. Categories: Dear God, Make It Stop! and iPhone. Sounds disturbing? You have no idea. (Unless of course you have one.) All the icons start wiggling. But it’s a subtle wiggle. Just enough to wonder if you’ve had a bit too much rum or something. Not that I ever have that problem. Anyhow, finally getting the “find yourself” function in Google Maps is way cool. Even though all the Nokia E6x users have had it for months. Heck, the freakin’ MDA users have had it for a while. But I bet my user interface for it is better.